OReviewer: Archiving per owners request via email. The BACKWARDS TUNNEL is listed on the National Register of Historic Places. It is close to the world famous Sterling Hill Mine which offers daily tours. The BACKWARDS TUNNEL was built in 1871 by the Midland Railroad. 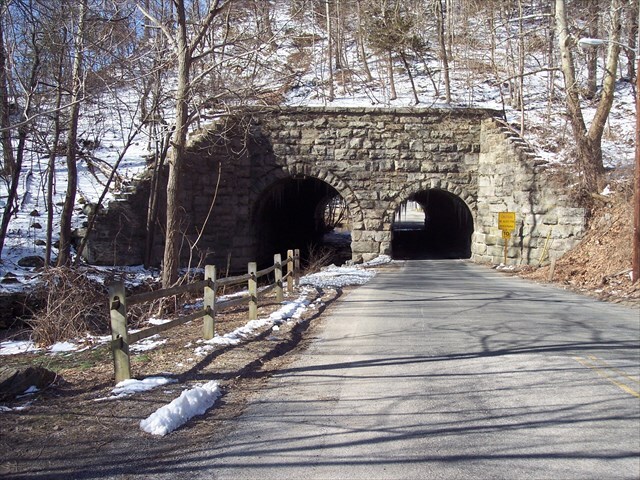 Local legend has it that it was built backwards because the tunnel for the road in much smaller than the tunnel for the northward flowing Wallkill River. Some argue that it is doubtful there was much consideration given to providing two-way wagon traffic through the tunnel in 1871 and more concern for high water flows during heavy rains. Looking at the tunnel in modern times it may just be possible that the structure was built backwards. Weren't there some large wagons in 1871? YOU DECIDE. The Wallkill River is stocked with trout in April and May ( usually on Mondays ) and therefore it becomes a heavy muggler area. There is a parking area very close to the cache. The cache is a camouflaged metal container with a screw on top containing a log and pencil. Gur pnpur vf ng gur onfr bs gur gerr orgjrra gur ebhaq envy srapr naq gur evire, ylvat haqre gur ebbgf.